You may have heard about the Tax Cuts and Jobs Act of 2017, which is going to change a lot of things about how people do their taxes. One of the biggest impacts will be on those going through divorces and dealing with alimony payments. 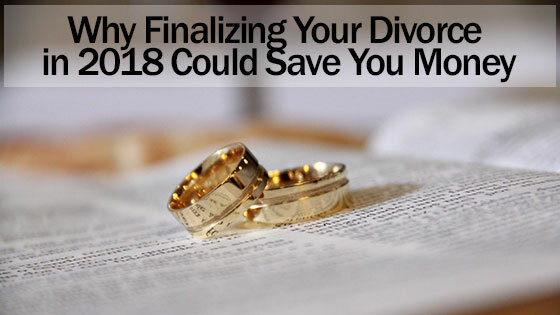 If you are interested in learning how you can save money by finalizing your divorce in 2018, you may want to consult a divorce attorney from the Law Offices of David Kohm. The TCJA and Alimony Payments: What is Changing? As of now, alimony payments are tax deductible, and those who receive alimony are required to pay taxes on that money. As soon as we enter 2019, those days are over. Former spouses who receive alimony payments will no longer have to pay any taxes on that money, and those who are making the payments will no longer have the option of listing them as deductions. If you’re paying a former spouse who earns a high income, that can make a big difference. If you’re a former spouse who plans to receive alimony, you might be thinking that this is a great thing. However, experts believe that this change will hurt the receiving spouse as much as it will the payer. This is because over time, it will significantly lower the paying spouse’s income, resulting in lower alimony payments being given out. Taxes on the Home: What Effect Does the Change Have on Housing? Many divorces involve a family home that was once shared, and this new law is complicating things even further. Along with eliminating alimony payments as a deduction, it also reduces the deductibility of property taxes and the percentage of the mortgage payment that can be deducted. In other words, it’s going to get more expensive to be the one who keeps the house. Deciding whether you will sell your home as a couple before finalizing your divorce might be a wise choice. In some cases, it’s best for both parties to simply move on to a new location. If you believe you will stay in the home for many years, that’s one thing, but if you think you might sell it a few years down the road, it might be better to do it now. Married couples can get up to $500,000 in capital gains before they must pay taxes on the money, but if you’re single, that amount is cut in half. When What You Agreed on Changes: What About Your Prenup? Your prenup is based on the law, and when the law changes, your prenup unfortunately changes with it. Every agreement is different, so you’ll need to talk to your divorce attorney about how the agreement might be amended. This might be wise even if you aren’t planning on divorcing. Hopefully, your marriage stays strong, but if you were the type to get a prenup in the first place, you likely prefer to stay on top of your legal and financial situation. Talking to your lawyer can’t hurt. Making the decision to move forward with a divorce is never easy, and no one wants to let something like tax law make an impact on such a personal decision. However, if your marriage was hanging in the balance, and you were already leaning toward divorce, it makes sense to take these factors into consideration. If you do, you’re not alone. Divorce lawyers have been seeing a major spike in client consideration for divorce so far this year. Getting a divorce finalized before the end of 2018 will ensure that your alimony situation is subject to the old law, and you won’t have to worry about these new changes. If you need a divorce attorney, please call our law offices today at any of our convenient locations and get a free consultation.